Community Consolidated School District 59 will begin kindergarten and new student registration for the 2019-20 school year on Thursday, February 21, 2019, with a special evening registration from 5:00 – 8:00 pm at all of the district’s elementary schools. Registration will then continue beginning on February 26, 2019 at each school from 9:30 – 11:00 am and 1:00 – 3:00 pm on days that school is in session. Choice program options are available, including the Two-way Dual Language Program (Spanish/English) and Ridge Family Center for Learning. All CCSD59 residents with incoming kindergarten students can apply for choice programs. Any parent wishing to enroll their student at the Ridge Family Center must register at that building. The registration deadline for these choice programs is March 13, 2019 and a lottery process (draw date of March 15, 2019) is used if the number of applicants exceeds available slots. For more information about the Two-way Dual Language Program, please contact Nancy Torres at (847) 593-4305. For information about the Ridge Family Center for Learning, please contact the school at (847) 593-4070. It is important to remember that the Polish Dual Language Program is not a choice program. This is a One-way Dual Language program for English Language Learners that have Polish as a heritage language. Students are admitted into the program based on their eligibility to receive English Language Learning services. In accordance with Illinois School Code guidelines, your child must be 5 years old on or before September 1st to be eligible for kindergarten. ** Children who attend Ridge Family Center for Learning, which operates on a balanced calendar, must turn 5 within 30 days of the start of the school year. Parents should bring their child’s certified birth certificate when registering their child for kindergarten. A birth certificate or other reliable proof (as determined by the Illinois Department of State Police) of the student’s identity is required by state law to prove a child’s identity and age. If no birth certificate is submitted at the time of registration, a parent must fill out an affidavit explaining the inability to produce a copy of the birth certificate and must provide it within 30 days of the start of school. Birth certificate request forms are available at all CCSD59 elementary schools. Additional information needed at the time of registration includes: phone numbers for parents and guardians (home, cell, and work, as applicable), email addresses, and an emergency contact name and telephone number. In order to register, the parent/guardian will also be required to verify residency by producing three current documents including items such as: most recent real estate tax bill, signed lease for residence, current driver’s license, gas or electric bill, voter’s registration card and/or other acceptable documents verifying residence in CCSD59. Please contact the district office or the appropriate school with any questions to be sure you have the proper documentation needed to register. Required paperwork for enrollment will be available to complete beginning on 2/21/19 at the schools or may be printed off of the enrollment page here. Please contact your school if you have questions regarding the enrollment packets. At registration, parents/guardians will be given state physical examination forms and information to be completed and filed with the school before the start of the 2019-20 school year. Dental forms will be distributed and must be returned by May 15, 2020. Vision examination forms will also be distributed and must be returned by October 15, 2019. Please note, parents/guardians of children who have attended CCSD59’s Early Learning Center or the Preschool Program (hosted at Ridge Family Center for Learning) are still required to register their child at the appropriate school via the registration packet for kindergarten students. 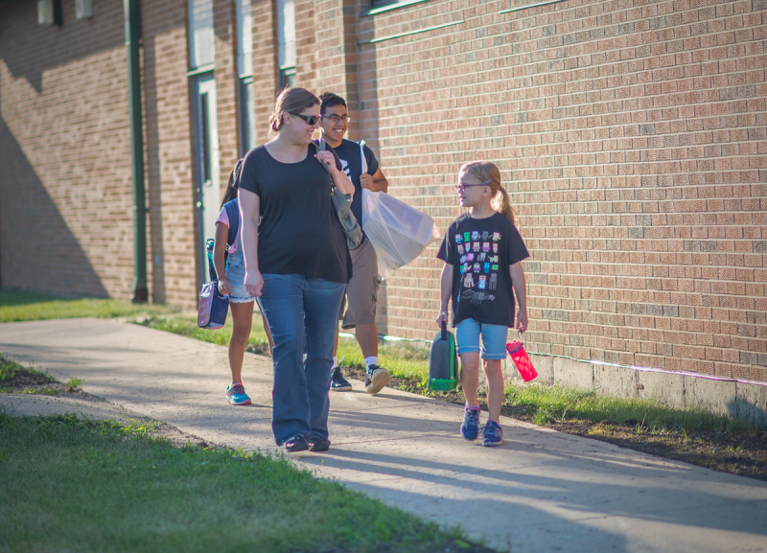 Residents with questions regarding new student registration can contact the CCSD59 administration office at 847-593-4300 or the appropriate school office. We look forward to meeting our new students and families in the 19-20 school year.